he is so much the poorer for it"
The enterprising Balaji Publications have already produced books which facilitate to easy learning of different languages of our country. I congratulate the proprietor on his resourcefulness in doing this yeoman service for national integration in our country. He has taken up this task in collaboration with a learned author Sri Kizhathur K. Srinivasachariar, who is a distinguished multi-linguistic scholar. The fact that even soon after the anti-Hindi agitation there was growing demand from students, for these publications which would amply demonstrate that the Tamilian student knows what is his need; he is eager to learn the lingua franca to better his own prospects. The Tamilian enjoys a reputation that he has a genious for learning other languages. The Balaji Publications have also brought out useful publications for the benefit of students belonging to other non-Tamil States. There is now great urge in the States like Uttar Pradesh and Rajasthan to learn Tamil. The book enabling the Hindi student to Learn Tamil in 30 days is a wonderful facility that should be taken advantage of by students of these States. I am glad that the Balaji Publications have brought out valuable books which would enable the learning of Sanskrit through English, Tamil and Telugu. If one does not know the classical language of India, Sanskrit, he is so much the poorer for it. Those who study Sanskrit derive the benefit of out rich heritage. The people of other countries like Germany began to appreciate the usefulness of the study of Sanskrit long time ago. Even for enjoying the beautiful poetry of classical Sanskrit literature it is worth while to acquaint oneself with that language. 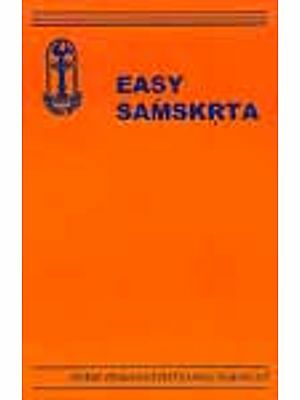 These books provide the easy way of learning Sanskrit through English, Tamil and Telugu. I have no doubt that students in India and abroad would take good advantage of this facility that has been offered by M/s. 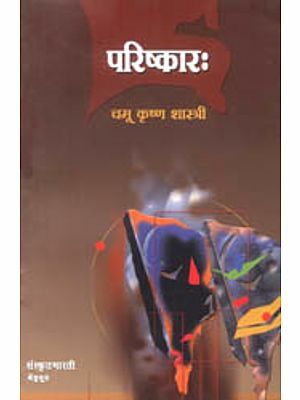 Balaji Publications. I do hope that there will be a large demand for these books. I offer the publishers and the author my warmest felicitations and best wishes. The Indian constitution recognized the eternal merit of Sanskrit when it approved this language as one of our fifteen National languages. The unique merit of Sanskrit lies in its outstanding achievement of the cultural unity of our great country. India is revered and respected because of her spiritual and cultural greatness endowed by the valuable Sanskrit scriptures like Vedas, Puranas, and Smritis. It is clear therefore that Sanskrit has been recognized on its special merit. It matters little though millions do not speak and write it. The other fourteen Indian languages have been accepted as national languages as millions speak and write them. The public are well acquainted with out venture in the specialized line of publishing books in all the fifteen National languages as well as inter-state languages in a phased programme which come under the general title of "The National Integration Language Series". This book is one of the series whose author Vidyavisarada Sri K. Srinivasachari P.O.L., Siromani, Hindi Visarad is an erudite scholar. 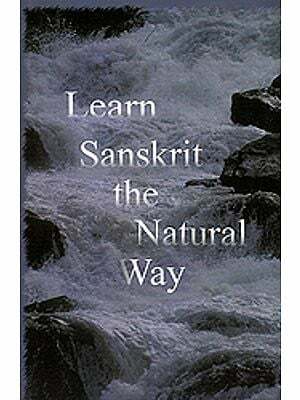 He has spared no effort in this book to make the learning of Sanskrit far easier than one would imagine. We earnestly hope that the pains we have taken will have their due reward through the ready response from the learned public. The term 'Sanskrit' as used now means 'well done' or rectified,'. 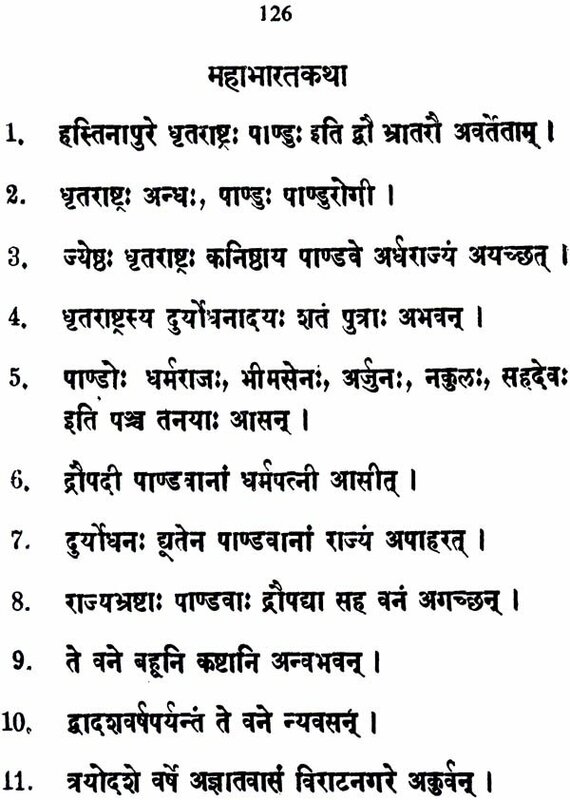 The Vedas, the universally accepted first scripture of humanity were written in this language. The rituals and modes of worship mentioned in the Vedas are directly related to the gods (Devas). There is also a deep rooted faith among the Indian public that Sanskrit is the language of Devas. 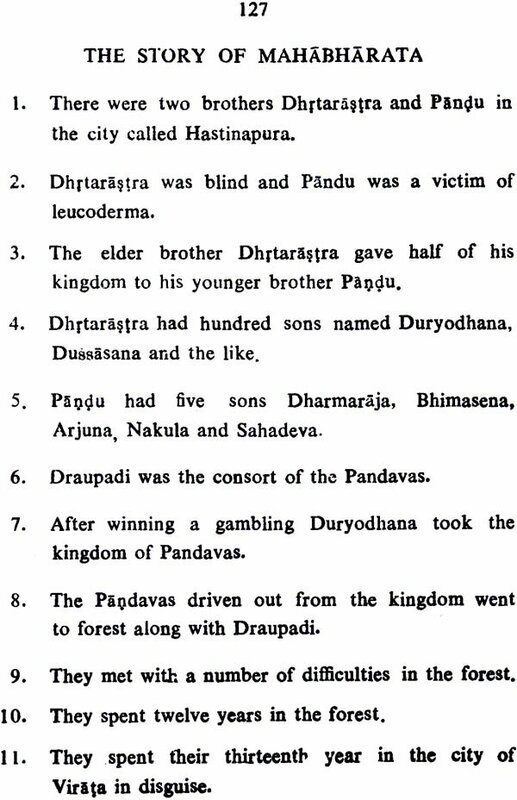 Hence this language was rightly called Daivi vak (Deva Bhasha) during the vedic period. Panini, the great grammarian endowed this language with his famous grammar in the 7th century B.C. From then on, this language was known as 'Samskrtam'. A number of great works of eternal value like Ramayana, Mahabharata, Puranas, Darsanas and equally valuable poetic and dramatic works of Kalidasa, Bhasa, Magha, Bharavi and the like were written in Sanskrit language. Besides, the great sciences indispensable to the life and progress of humanity like Astronomy, Astrology, Medicine, Architecture, Physical sciences and other branches of knowledge were for the first time written in Sanskrit alone. Even a layman of the olden days was quite able to understand and appreciate these great works though unable to speak in Sanskrit. But the Sanskrit Scholars of olden days acquired the rare ability to speak fluently in this language. Even in the modern days we know of several eminent Scholars in India and abroad having the ability to speak fluently in this language. It is therefore needless to say that Sanskrit was ever a living language. It will continue to be so as long as civilization exists. People all over the world thirsting for knowledge had been evincing great interest to study Sanskrit fro the days of distant past. The interest has gathered momentum in the modern times. The old method of learning the script and the grammar at the initial stage was indeed a difficult and tedious process. 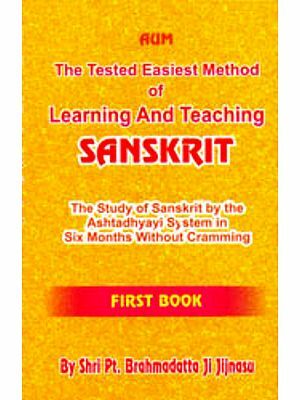 We have therefore evolved a novel method to help people to learn Sanskrit with the aid of their own script. The knowledge of Nagari script and a tutor are not necessary. The novel method is nothing but the transliteration of alphabets and words which we have adopted as we have done in the other books of our Integration Series. This book consists of FIVE parts: THE FIRST PART (pages 17-32) contains all kinds of Sanskrit alphabets of Devanagari character i.e. the vowels and consonants and conjunct consonants etc. with their usage in words. How to write the vowels and consonants have also been shown with diagrams at the beginning of the book. The SECOND PART (pages 33-89) deals with the nouns and verbs in their various forms. This is more like the method of Sabdamanjari and Dhatumanjari. They insist on the memorization of some nouns and verbs with all cases, persons and numbers. Therefore students should practice them orally and in writing. The THIRD PART (pages 90-105) gives information about some Pronouns as well as some indeclinables used very often. The FOURTH PART (pages 106-146) consists of exercises such as stories, essays, conversations, some moral passages Translations. etc. etc. THE FIFTH PART (pages 147-212) gives full information about Sanskrit Roots, verbs & verbal derivatives with their usage in sentences. The classified nouns and the glossary given at the end will help the students to translate English into Sanskrit and vice-versa.